Your accountant may use another finance system to manage their general ledgers. Aligning codes means your accountant will be able to easily export transactions from Cashmanager Rural into their general ledger without having to do rework to make the codes make sense in the general ledger. This saves your accountant time and therefore will save you both time and money. Aligning codes is compatible with most general ledgers including: Solution 6, MYOB, XLON 2, APS and Xero. Your accountant will be able to manually export transactions from Cashmanager Rural directly into their general ledger. Tip: As well as exporting coded transactions into a general ledger, aligning codes also works for importing transactions if you use Banklink. Aligning codes means that Banklink transactions will be imported precoded into Cashmanager Rural. How handy is that! If you want your Accountant to help with mapping account codes in Cashmanager Rural you’ll need to give them ‘Admin’ or ‘Controlled’ access which will allow them to alter the Code List. -- > Who should align Cashmanager Rural to Accountant codes? 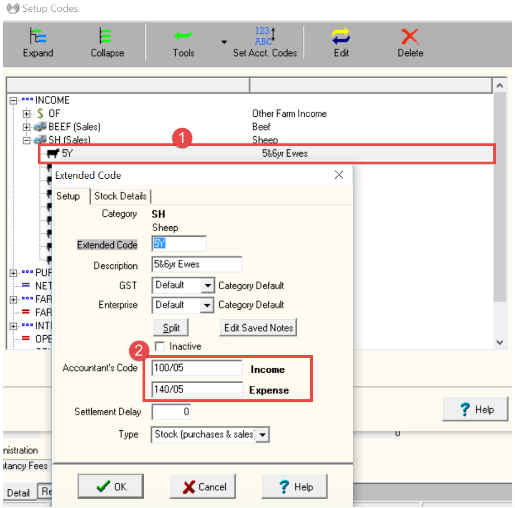 Either you or your accountant can align the codes as after you give admin access to your accountant you will both be able to do this in Cashmanager Rural. There are benefits to aligning codes yourself such as saving money on accountant fees. You will need still to ask your accountant for their codes though. The main benefit of your accountant aligning the codes themselves is they will be less likely to make errors with the Accountant codes, as they’re familiar with their own codes and general ledger practices. -- > Three ways to align the codes. Use the table to help you select which option is best for aligning your codes then follow the steps. Through Set Acct. Codes You can align all your codes in one session using this method. When aligning the codes in bulk, like the first time you align accountant codes to Cashmanager RURAL. Through Setup Codes Aligning codes as you see they need to be done, enter as you go. If only aligning a few codes. Online through www.cashmanagerrural.nz to Xero or MYOB This is for accountants who export database transactions into their Xero or MYOB General Ledger (GL) If you have Cashmanager RURAL online and your accountant uses Xero or MYOB as their GL. In the transaction screen select Setup > Codes and then Set Acct. Codes. Enter the corresponding accountants code for each Cashmanager Rural code by selecting a box and typing the numerical code in it. If income or expense codes are greyed out this is because Cashmanager Rural recognises that particular item is only an income or expense. Therefore there is no need for separate accountant codes for income and expense. When all accountant codes are entered Click OK to save changes. 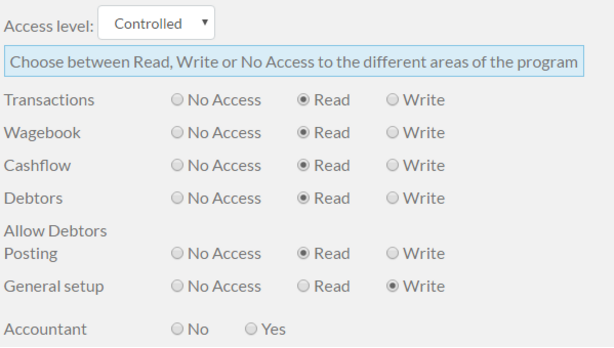 Codes can also be aligned by editing the Category and Extended codes. If you are adding or editing a lot of codes it is easier and quicker to do this through the option above. If you are only editing one or two codes as you go through Setup Codes is a good way to do this. In the transaction screen select Setup > Codes to bring up the Setup Codes box.and Select the code you want to edit from the list. If the General Ledger has already been selected upon registering for Cashmanager Rural Online, and codes haven’t been aligned, the program will prompt you to enter accountants codes. Click on Edit Code action to align codes or Map GL codes to align any codes that are missing from transactions. Any sections that require codes to be mapped are highlighted by the triangle symbol. The rounding tab is only available if the account GL is Xero. -- > Once the codes in Cashmanager Rural have been aligned to the Accountant’s codes, it’s easy to export transactions from Cash Manager Rural directly into a general ledger. If you have Cashmanager Rural Online and your accountant uses Xero or MYOB you can export transactions through the Align codes through Cashmanager Rural steps. If your accountant uses a different general ledger from Xero or MYOB or you are not registered for Cashmanager Rural Online then you will need to export transactions from transaction screen. Click Export > Accountants, this will bring up the Accountants Export box. Select the general ledger the transactions will be exported to and this will export them in the correct file format for you. You will then be able to import the file into the General Ledger. Work with your accountant to put regular checks in place to update your codes and make sure they are aligned. If aligning codes and exporting transactions online through Connect to GL, alerts will automatically appear when codes are missing for transactions. 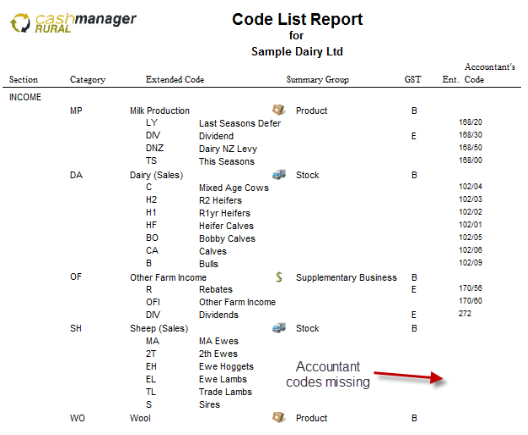 At the end of financial year, through the Accountants Annual Report you can identify any codes that haven’t been mapped to accountants codes. 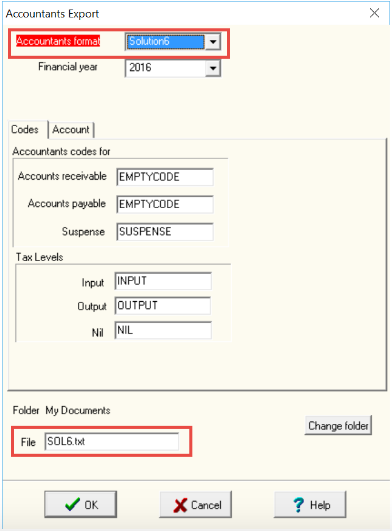 Alternatively your accountant can check for codes that need aligning through Setup > Codes and the Edit Accountants Codes box.